Never dispose of a driver side knee airbag assembly with an undeployed airbag. 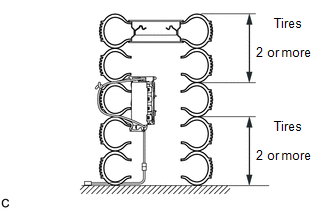 When deploying the airbag, perform the operation at least 10 m (32.8 ft.) away from the driver side knee airbag assembly. The driver side knee airbag assembly becomes extremely hot when the airbag is deployed, so do not touch it for at least 30 minutes after deployment. Use gloves and safety glasses when handling a driver side knee airbag assembly with a deployed airbag. Do not apply water etc. to a driver side knee airbag assembly with a deployed airbag. When scrapping a vehicle equipped with an SRS or disposing of the driver side knee airbag assembly, be sure to deploy the airbag first in accordance with the procedure described below. If any abnormality occurs with the airbag deployment, contact the Service Dept. of TOYOTA MOTOR SALES, U.S.A., INC. When disposing of the driver side knee airbag assembly, never use the customer's vehicle to deploy the airbag. (d) Disconnect the driver side knee airbag connector. 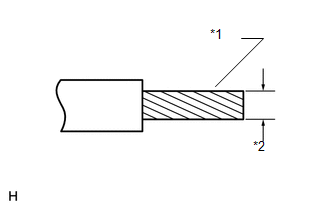 (1) Using a screwdriver with the tip wrapped with protective tape, disconnect the airbag connector. Check that there is no looseness in the driver side knee airbag assembly. 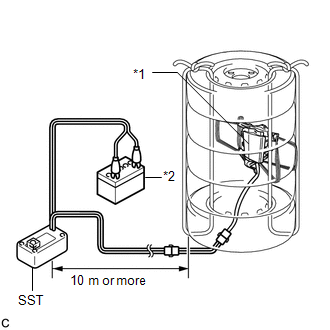 (1) Connect the SST connector to the driver side knee airbag assembly. (2) Move SST at least 10 m (32.8 ft.) away from the side window of the vehicle. 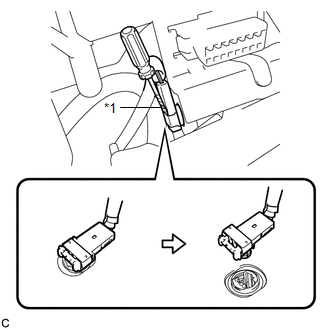 (b) Remove the driver side knee airbag assembly (See page ). Before removing the driver side knee airbag assembly, wait at least 90 seconds after turning the ignition switch off and disconnecting the cable from the negative (-) battery terminal. 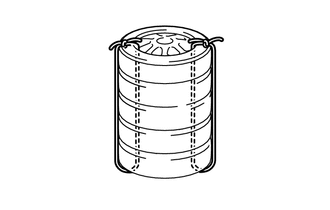 When storing the driver side knee airbag assembly, keep the airbag deployment side facing upward. (c) Using braided wire, tie down the driver side knee airbag assembly to an unneeded tire. 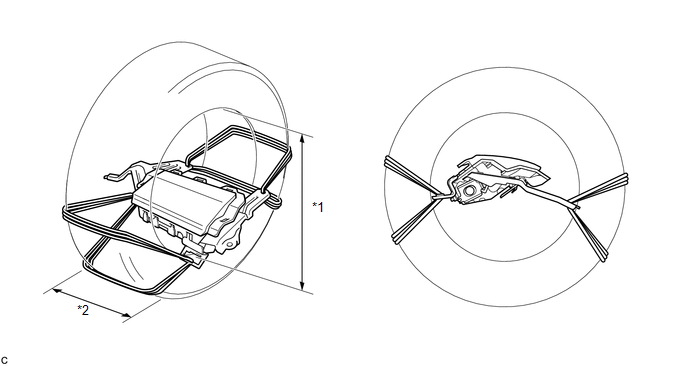 If the wire is too thin or an alternative object is used to tie down the driver side knee airbag assembly, it may snap when the airbag is deployed. 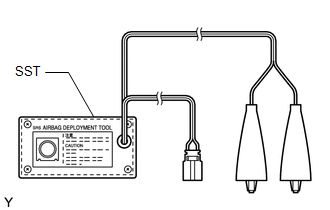 Always use a wire for vehicle use with an area of at least 1.25 mm2 (0.0019 in.2). (1) Position the driver side knee airbag assembly inside the tire with the airbag deployment side facing inside. Make sure that the wires are tight. 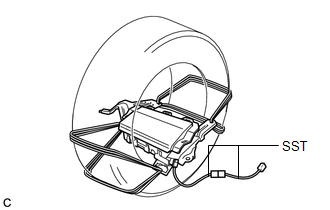 If there is slack in the wires, the driver side knee airbag assembly may break loose when the airbag is deployed. 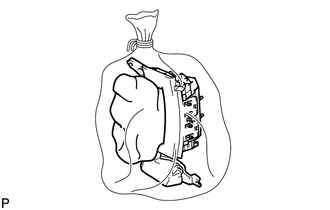 Always tie down the driver side knee airbag assembly with the airbag deployment side facing inside the tire as shown in the illustration. The tires may be marked by the airbag deployment, so use an unneeded tire. 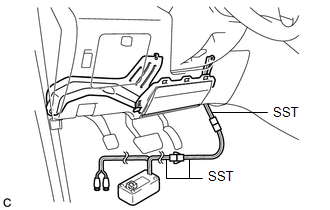 (1) After connecting the following SST to each other, connect them to the driver side knee airbag assembly. 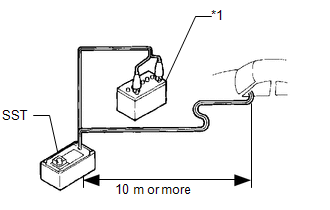 (1) Place at least 2 tires under the tire to which the driver side knee airbag assembly is tied. (2) Place at least 2 tires onto the tire to which the driver side knee airbag assembly is tied. The top tire should have a wheel installed. (2) Check that no one is within a 10 m (32.8 ft.) radius of the tire to which the driver side knee airbag assembly is tied. (h) Dispose of the driver side knee airbag assembly. (1) Remove the driver side knee airbag assembly from the tire. (2) Place the driver side knee airbag assembly in a plastic bag, tie it tightly, and dispose of it according to local regulations.